Whether you want to stop racking your beer or cut down cleaning time, a conical fermenter might be just what you’re looking for. They’re not the outrageously expensive, professional-brewers-only vessels they used to be. Sure, some of them are still a bit on the pricey side, but hey, if quality is high on your list of must-haves, you expect to pay a little more for it, right? Homebrewing is absolutely a worthwhile pursuit, but it’s also a time-consuming one. The more ways you can make your brewing efficient, the less time you can spend brewing, and the more time you have to actually enjoy the results. Anything that can make your homebrewing process a little easier and less messy, and increase your beer’s quality is worth consideration. What is a Conical Fermenter, Anyway? If you’ve ever visited a large brewery, you may have seen a line of stainless steel tanks with what look like ice cream cone bases. These are just large conical fermenters If you click this link and make a purchase, we earn a commission at no additional cost to you. . Technically they’re cyclio-conical fermenters, but you get the idea. The smaller ones for home use are typically shaped like a regular kettle with a cone at the bottom. 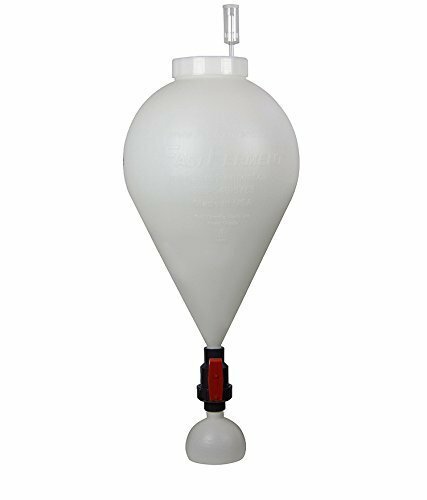 Some manufacturers offer plastic conical fermenters which may come in more imaginative shapes, like a balloon or lopsided hourglass. But why does the shape matter? What makes a conical fermenter so great? If you’re using a fermentation bucket If you click this link and make a purchase, we earn a commission at no additional cost to you. —a common tool in beginner homebrewing kits—you want to avoid transferring trub to a secondary fermenter or keg. Trub is a combination of dead proteins, yeast, and wort debris. It forms a sediment which can make your beer hazy. It’s also not appetizing to look at or drink, especially if you’re brewing a lighter beer. Trub isn’t entirely bad. In your primary fermentation, it may actually give your beer a hoppier and crisper aroma. Just make sure you keep it out of your secondary fermentation. Conical fermenters allow the trub and yeast to gather at the bottom of the cone. From there, you simply dump the sediment by either removing a containment unit or draining with a hose. That means there’s no need to rack or transfer to a secondary fermenter like a carboy If you click this link and make a purchase, we earn a commission at no additional cost to you. . In short, it makes it easier to brew clear beer. It’s important to note, however, that while racking to a secondary fermenter was once a must-do part of homebrewing, that advice has fallen by the wayside over the last decade or so. You may still be doing it, but you risk oxidation every time you do. This is yet another advantage to using a conical fermenter If you click this link and make a purchase, we earn a commission at no additional cost to you. . Not only do you eliminate a labor-intensive step from brewing, you protect your beer from oxidation, and from contamination that can occur during the racking. 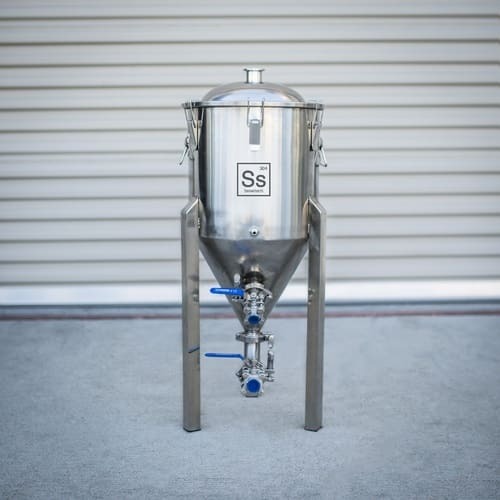 You’ll find a lot of conical fermenters are made of stainless steel If you click this link and make a purchase, we earn a commission at no additional cost to you. , and with good reason. They’re easier to sanitize and last much longer than your typical plastic bucket. Plastic can also be easily scratched, which can create environments for bacteria to hide, survive, and thrive. Plastic conical fermenters If you click this link and make a purchase, we earn a commission at no additional cost to you. may be less expensive, but they’re not as long-lasting or sanitary as their stainless steel counterparts. You’re also cutting down on equipment and cleaning by using a conical fermenter. You don’t need to rack, so all that equipment is unnecessary. You may need one hose If you click this link and make a purchase, we earn a commission at no additional cost to you. to siphon off trub, depending on the vessel, but it cuts out any secondary fermentation vessels that you’d still need a hose for anyway. Yes, you read that right. Just as you remove the trub from your beer, you can collect the yeast as well. It can then be washed and reused in a later brew, which can save you money over buying new yeast for every batch. Sound weird? Yeast washing is actually a lot more common than you may think. The cost of yeast can be prohibitive when brewing massive batches. Commercial brewers don’t need to store the yeast as long or as often as you probably do for your homebrewing. They typically use only one strain of yeast whereas, if you’re like most homebrewers (including us! ), you tend to experiment more. Reusing yeast is not just about saving money. You’ll often get better fermentation on the second batch because the yeast is already alive and active as long as you sanitize and store your yeast properly. This is especially helpful if you want to brew a high-gravity beer. Brewing a low-gravity beer first builds up more yeast cells to ferment a high-gravity beer on the second round. It’s like a giant yeast starter, except you get another delicious drink out of it. Saves effort. Saves time. Saves money. With that trifecta of awesomeness going for it, why wouldn’t you use conical fermenter? But how do you choose the right one? Not to worry! We did the research for you and found three plastic and three stainless steel options to fit a variety of preferences (and budgets). Plastic may be less durable than steel, but it brings down the price of a new conical fermenter. We found three food-grade plastic options that won’t break your homebrewing budget and still take a ton of work out of brew day. You can bottle directly from the fermenter without transferring, plus the tap has an adjustable flow rate. It has a simple vent that allows carbon dioxide to escape, but you can upgrade it to an airlock or blow-off tube later. While FastFerment’s conical fermenter is roughly twice the price of the BrewDemon, this vessel can hold up to 7.9 gallons (30 litres). It has a six-inch collection ball at the bottom of the fermenter for harvesting yeast and removing trub. The kit also includes a wall mount (this conical fermenter is too bulbous to stand on its own), but you can purchase a floor stand separately if you’re short on wall space. Made from clear polyethylene terephthalate (PET), the Fermentasaurus is the perfect size for five-gallon brews. The bottom of the fermenter has a butterfly dump valve with a 500-mL collection ball to remove yeast for reuse, or for trub disposal. 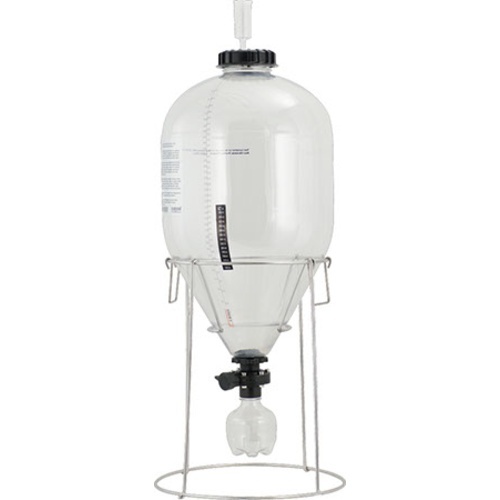 This conical fermenter’s valve is designed to keep the thread from immersion, so it’s also much easier to clean If you click this link and make a purchase, we earn a commission at no additional cost to you. .
You can also get a pressure kit If you click this link and make a purchase, we earn a commission at no additional cost to you. that goes with the system so you won’t need to transfer your brew to a keg to get more pressure. Unlike the other fermenters we’ve covered, this one is made of Tritan, which is a medical-grade, BPA-free polymer that combines the durability of glass and the convenience of plastic. It’s more scratch resistant If you click this link and make a purchase, we earn a commission at no additional cost to you. than other plastic fermenters and it’s even dishwasher safe, withstanding temperatures up to 230°F. 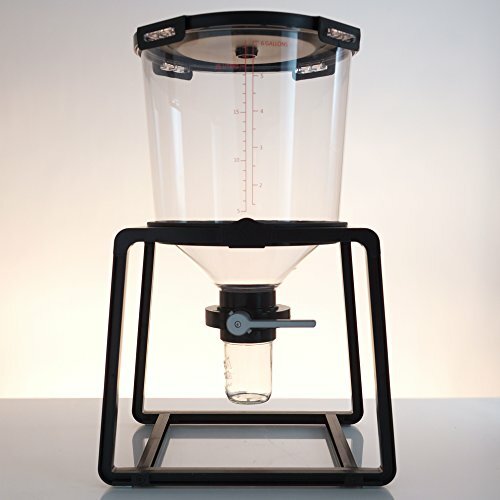 Craft a Brew’s system includes a 6.5 gallon tank and a removable stand for easy cleaning. The three inch butterfly valve at the bottom is compatible with any wide-mouth mason jar, so you can easily catch and remove trub, as well as harvest yeast during your secondary fermentation. Plus, you can bottle straight from your fermenter. As you start looking at stainless steel vessels, you’ll notice the price goes up by a few hundred dollars. Whoa, sticker shock! But think about all the time and effort you’ll save on top of the equipment you won’t have to replace anymore. Quality costs, but it’s worth it. The Chronical (not a typo—that’s what they call it) has a 60-degree cone ending in a Full Port 1.5″ opening. This makes dumping trub through an included elbow and ball valve as simple as can be. This food-grade stainless steel conical fermenter can hold up to seven gallons If you click this link and make a purchase, we earn a commission at no additional cost to you. at full capacity. The domed lid seals in place with a molded silicone gasket and six spring-loaded clamps, so no oxygen can ruin your brew. Sturdy stainless steel legs are attached to the vessel so you don’t have to worry about mounting it to the wall or accidentally tipping over a disconnected stand. Blichmann’s stainless steel conical fermenter is unique in that it’s not just a fermenter—it can also be a carbonation and serving vessel without any liquid transfer. The Cornical™ is a modular tank, so once you’re ready to move from fermentation to carbonation, all you have to do is drain the trub, flip the tank over, switch out the conical bottom for a keg bottom, and flip it right-side-up. The Cornical™ also has a rotating rack arm with a sanitary sample valve so you can test your beer without opening If you click this link and make a purchase, we earn a commission at no additional cost to you. up the fermenter. Cleaning is also easier because you can remove both the bottom and the lid. Made in the MoreBeer! 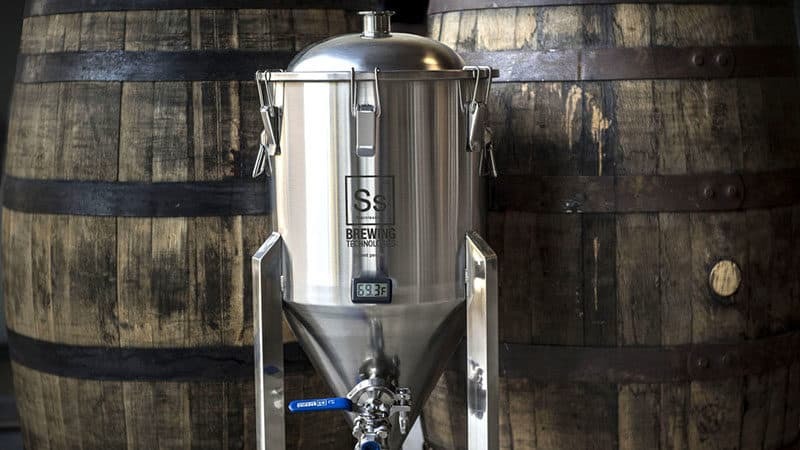 Metal Shop in the United States, this stainless steel conical fermenter can hold up to five gallons of beer and handle up to five pounds per square inch (psi) of pressure. The gasket is made of a durable, food-grade silicone, and the domed lid has tri-clamp fittings for added security. Its racking arm is adjustable, so you can choose where you draw beer from inside the fermenter. 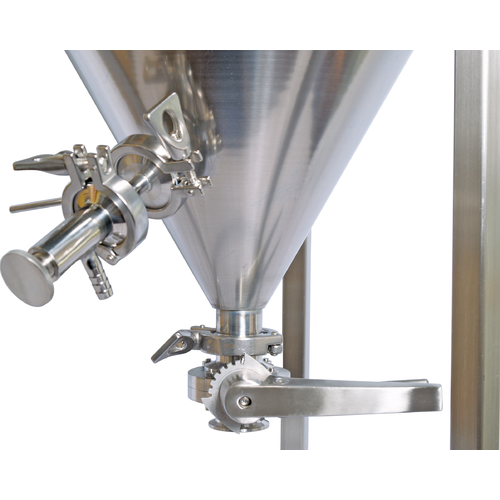 The conical fermenter has a 1.5″ butterfly valve for dumping trub, as well as a sanitary sample and transfer valve. The cone detaches from the stand for easier cleaning If you click this link and make a purchase, we earn a commission at no additional cost to you. 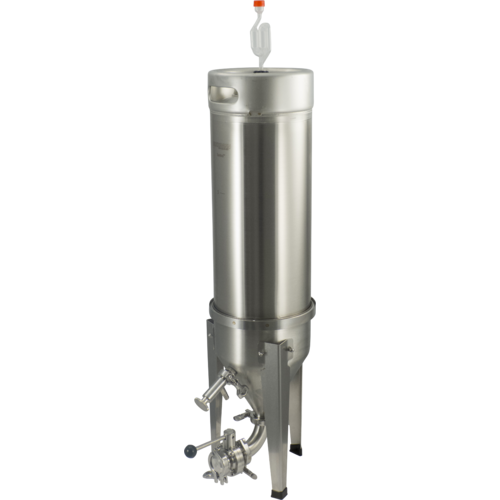 , and you have the options to customize your fermenter with leg extensions, wheels, blow-off valves, and more. With proper care—which includes washing and sterilizing with the right brewing sanitizer—a good conical fermenter can last you a long time. They may be more expensive than your typical fermentation bucket or carboy, but they can pay for themselves in the long run through savings on yeast and replacement homebrewing equipment. Plus, we think you can work smarter, not harder. 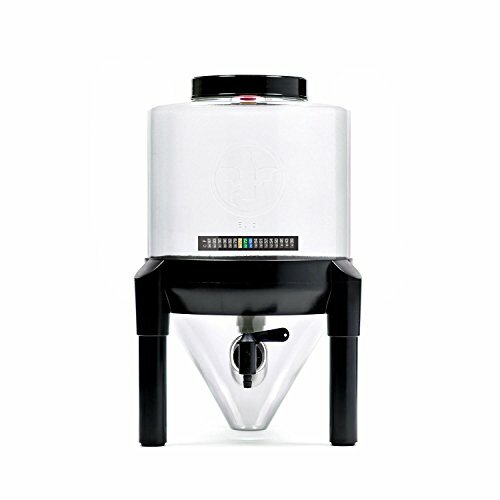 Brewing beer takes a lot of effort, but it can be so much easier with a conical fermenter. Give it a try!